It all started in a dentist’s waiting room in France, with a magazine feature on a New York construction whose twin towers would absolutely dwarf the Eiffel Tower. The teenage Philippe Petit was so entranced, he ripped the article out and stuck it up his jumper. 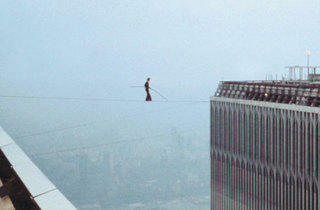 He dreamed right then of walking on a wire between what would become the two towers of the World Trade Center, and, in 1974, he actually did it. 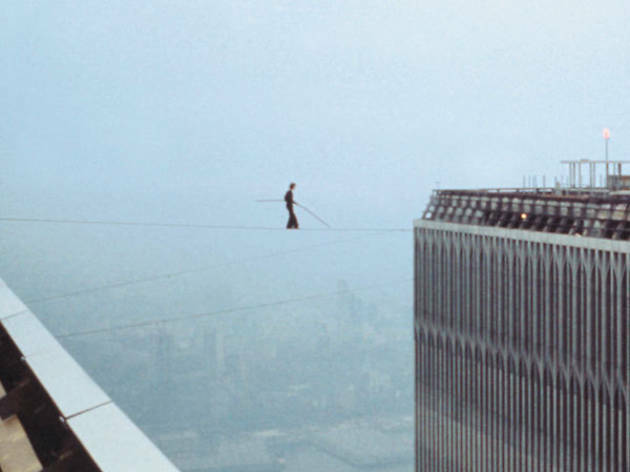 Just how this act of graceful insanity came to pass is chronicled in Marsh’s captivating documentary, which intercuts the build-up and execution of the walk itself with Petit’s remarkable backstory. This was no spur-of-the-moment fluke, but the result of years of globe-trotting preparation with a support group of like-minded individuals, each of whom pop up in interviews to express awe-struck concern for their fearless leader. Petit himself twinkles here too, exuding such voluble Gallic esprit that he could hold us in his spell for 90 minutes on his own. Not that seeing the man himself detracts from the palm-slicking suspense the film develops as the mission hits almost surreal snags even before the soon-to-be-famous funambulist steps out on to the thinnest thread. Nor, indeed, does the absence of surviving locations knock Marsh off his stride as he contrives sequences of playful dramatic fakery to sustain the tension. Although some viewers may find the too-familiar Michael Nyman cues and over-used Erik Satie pianism a disappointingly earthbound musical accompaniment, for the most part there’s storytelling magic here which makes the film so much bigger than just some expert BBC-funded reconstruction. There’s no mention of the building’s subsequent fate; instead, a generous, visionary gesture supplanting the communal memory of the site’s unspeakable horrors with an image of human achievement that’s head-spinning, heart-leaping in its absurd purity. These docmentarians know how to tell a story. This is almost a love story of two buildings who played majestic back-up characters to a dream that one man had.